The power of 3D diagnosis and treatment planning. Traditionally, dental x-rays showed you only a 2D picture. Cone Beam Computer Tomography (CBCT) is a 3D dental scanning technology that provides us with detail never imaginable a few years back. All this at a fraction of the radiation than conventional medical CT scans. With CBCT, we are able to virtually plan surgery with an extremely precise digital reconstruction of your teeth and jaws. We, therefore have a lot more information about anatomical structures and bone volume – that was at one time only known once the surgery had already begun. CBCT allows us to plan surgeries more accurately. As a result, we provide shorter, more precise surgery. These benefits are why the American Academy of Oral and Maxillofacial Radiology (AAOMR) recently changed its guidelines to state that cone beam CT scanning is the gold standard in implant treatment planning and pre-surgical assessment. In this case, the patient required a wisdom tooth extraction due to infection. 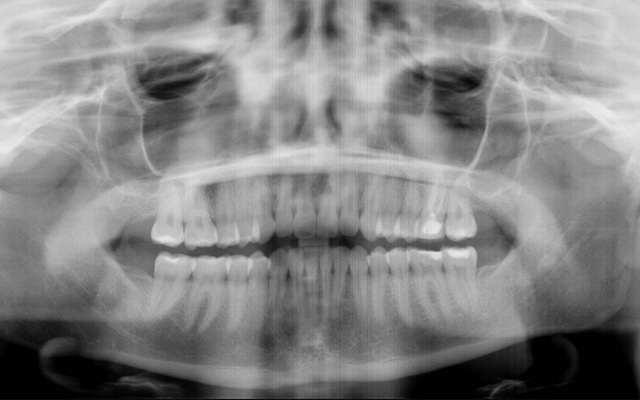 On the routine panoramic x ray, it appeared that the nerve (purple) in the jaw was in direct contact with the wisdom tooth. With our 3D CBCT, we were able to determine that the nerve was in fact resting in front of the roots of the tooth and therefore out of harm’s way. The difference was only detectable in 3D. So this provided us peace of mind and helped us make the proper decision on treatment. 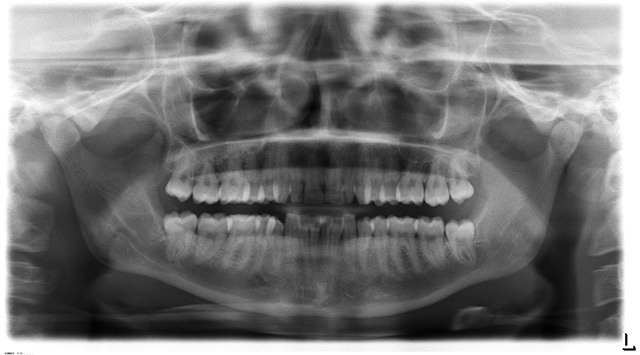 Here is a case where a patient had seen multiple doctors regarding tooth sensitivity. Conventional x-rays showed no pathology and a diagnosis was proving quite difficult to attain. We therefore decided to do a 3D scan. Upon checking the tooth in question, we were finally able to clearly diagnose the problem. Knowing more can often lead to more effective diagnosis and less treatment. This patient is having a routine single implant procedure to replace a tooth that needs to be removed. 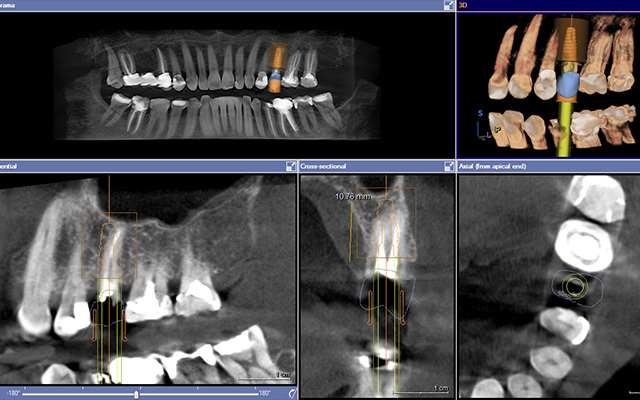 Here the virtual tooth (blue) and virtual implant (orange) is superimposed over the existing tooth to be extracted. The nerve of the jaw is also visible (purple). Planning the implant with our CBCT, allows us to ensure that the bone is adequate and that the implant is placed precisely where it needs to go. Implant placement and position is critical for long-term success of a new tooth. Once the planning phase is complete, we produce a surgical guide using the data from the dental scan. The guide is milled and worn by the patient during surgery. It allows us to place every implant with pinpoint precision. Here are examples of guides used during surgery. Now compare that to planning a surgery using only conventional dental x-rays where none of the above planning is even possible. The difference is enormous! The following patient is missing a lower molar and is ready to have a dental implant placed. With 3D planning, we are able to design what the final tooth should look like and where it should go – so that the implant can be placed in the ideal location. This helps to ensure long-term success. In this case you can see the position of the nerve (purple), the virtual tooth (blue) that is currently missing and the precise location of where the implant will be placed during surgery (green). The more information you have prior to surgery, the better prepared the surgeon. That’s how to achieve great results. Here is a 2D x-ray taken just after surgery to confirm the implant position. This patient will receive his new tooth in a few months.